What is Gothic Romanticism and who were the famous authors? Question by M: What is Gothic Romanticism and who were the famous authors? What’s the difference between Gothic, Romanticism and Gothic Romanticism? the supernatural, doom, death, curses and madness. gothic novels included ‘The Castle of Otranto’ and ‘Byronic Hero’. melodrama and gloomy atmosphere into his own books. gothic villain appeared in Bram Stoker’s ‘Dracula’ in 1897. 1. Setting in a castle. 2. An atmosphere of mystery and suspense. 5. Supernatural or otherwise inexplicable events. 6. High, even overwrought emotion. 8. The metonymy of gloom and horror. *Earrings are sold singly. Like a whispering shoulder devil or a witch’s familiar, this dragon, piercing through the ear lobe, tempts the wearer into acts of shameful depravity. 100% Britannia pewter. Hand made in England. Authentic Alchemy of England brand merchandise. 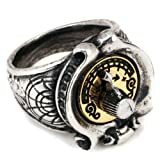 Two-tone steampunk style ring in Alchemy Gothic English pewter. Features a brass plate calibrated as a “gender gauge” and moveable pointer. The face and sides are formed in classic pseudo-industrial art deco, as if it were a miniature working instrument. Face is 3/4″ (20mm) tall, band is 4mm wide.